For glass and ceramic cooktop surfaces. 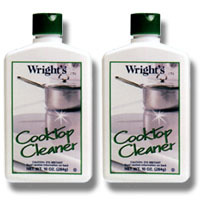 Cleans, shines, and protects glass and ceramic cooktops without scratching. Tough enough to tackle hard-to-remove foods and stubborn stains. Convenient 10 oz. bottle with flip top. Also ideal for conventional stovetops, countertops, ceramic cookware, stainless steel, bathroom fixtures, shower doors, fiberglass, and porcelain.